FC Barcelona remained perfect in their quest for their sixth Champions League title following their 2-0 victory over Inter. Rafinha and Jordi Alba scored as the team played without the injured Messi. Three wins from three games have the Blaugrana sitting as group leaders and inch closer to clinching a spot to the Round of 16. No Messi, no problem as Barça continued their winnings way in Europe. Rafinha gave Barça the lead after 32 minutes when he timed his run perfectly to meet Luis Suárez’s superb cross. Barça were in control for most of the game, with the lone exception of Ter Stegen being forced to make a superb stop to deny Inter a goal. The Blaugrana scored the insurance goal to ensure victory in the 84th minute after quick passing from the Blaugrana players resulted in Rakitic setting up Alba inside the box and the full-back looked like an experienced winger as he slotted the second goal from a difficult angle, much to the delight of those in attendance at the Camp Nou, including Messi. This result ensured Barça would remain group leaders with nine points from three matches while Inter are three points behind them while PSV and Spurs both have a single point. A victory in the return leg against Inter would guarantee a spot in the Round of 16. However, Barça will now shift their attention to this Sunday’s El Clásico when they host arch rivals Real Madrid at the Camp Nou. FC Barcelona: Ter Stegen, Sergi Roberto, Piqué, Lenglet, Jordi Alba; Busquets (c), Rakitic, Arthur (Arturo Vidal, min. 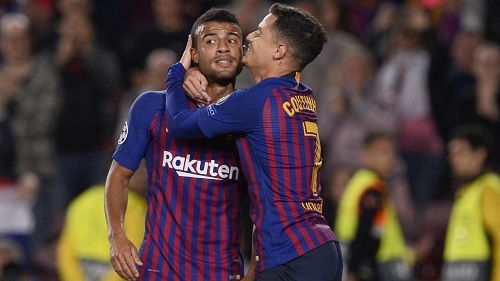 77), Rafinha (Semedo, min.71), Coutinho (Munir, min. 87) & Luis Suárez. Inter de Milán: Handanovic, D’Ambrosio, Skriniar, Miranda, Asamoah, Brozovic, Vecino, Candreva (Politano, min. 45), Borja Valero (Lautaro, min. 63), Perisic (Keita Baldé, min. 77) & Icardi (c). Goals: 1-0, Rafinha (min. 31); 2-0, Jordi Alba (min. 84). Cautions: Luis Suárez (min. 61), Brozovic (min. 73), Skriniar (min. 74), Lautaro Martínez (min. 85). Previous PostTime for Barça To Step Up.